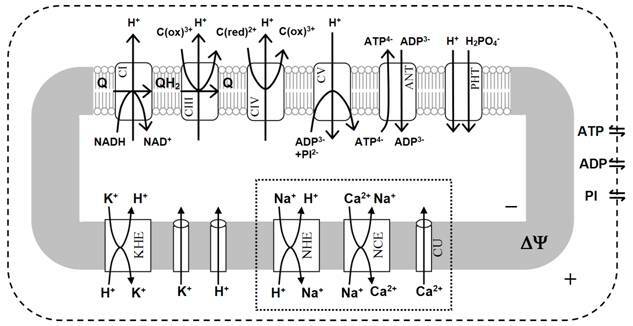 The paper first characterizes the kinetics of mitochondrial Ca2+uniporter, Na+/Ca2+ exchanger, and Na+/H+ exchanger (i.e., the kinetics of mitochondrial Na+– Ca2+ cycle), and then integrates these kinetic models into our existing biophysical model of mitochondrial respiratory system and oxidative phosphorylation. The integrated model is used to analyze data on the Na+ dose-dependent dynamics of mitochondrial Ca2+ to determine the stoichiometry of mitochondrial Na+/Ca2+ exchanger, as a 3Na+/Ca2+ exchanger. Figure 1: Fitting of Ca2+ uniporter (CU) model (lines) to data (points) on CU fluxes. (A,B) The initial rates of Ca2+ uptake (points) were measured with varying external buffer [Ca2+] in pu-rified respiring mitochondria from rat liver (A) (Vinogradov & Scarpa, 1973) and rat heart (B) (Scarpa & Graziotti, 1973). Also shown are the model-simulated CU fluxes at 5 different levels of IMM ∆ψ (lines) in which the model is fitted to the data with IMM ∆ψ = 190 mV. The estimated values of the kinetic parameters were (A) KCa,CU = 48 μM and XCU = 1.35X10-2 nmol/mg/s for rat liver mitochondria, and (B) KCa,CU = 90 μM andXCU = 1.5×10-2 nmol/mg/s for rat heart mitochondria. (C) The fitting of the same kinetic model to another data set is shown where the initial rates of Ca2+uptake were measured in purified rat liver mitochondria with varying IMM ∆ψ for 3 different levels of extramitochondrial buffer [Ca2+] (Wingrove et al., 1984; Gunter & Pfeiffer, 1990; Gunter et al., 1994). To fit the model to this data set,XCU is adjusted to 2.025 nmol/mg/s while keeping KCa,CU fixed at 48 μM. (D) Model-simulated CU fluxes are shown for purified rat heart mitochondria with varying IMM ∆ψ for 4 different levels of extramitochon-drial buffer [Ca2+] with KCa,CU = 90 μM and XCU = 2.25 nmol/mg/s. Figure 2: Fitting of Na+/Ca2+ exchanger (NCE) model (lines) to data (points) on NCE fluxes. The initial rates of Na+ efflux/Ca2+ influx (A,C) and Na+ influx/Ca2+ efflux (B,D) were measured with varying external buffer [Ca2+] and [Na+] (fixed matrix [Na+] = 25 mM and [Ca2+] = 18 μM), respectively, using proteoliposomes reconstituted with the purified mitochondrial Na+/Ca2+ anti-porter from bovine heart (Paucek & Jaburek, 2004). The NCE model was based on a 2Na+/Ca2+ stoichiometry (electroneutral exchange) in the upper panel (A,B) and a 3Na+/Ca2+ stoichiometry (electrogenic exchange) in the lower panel (C,D). For a 3Na+/Ca2+ electrogenic exchange, the model-simulated NCE fluxes at various values of IMM ∆ψ are also shown; the model is fitted to the data with IMM ∆ψ = –190 mV (C) or IMM ∆ψ = +190 mV (D). The estimated values of the kinetic parameters are KNa,NCE = 8.2 mM, KCa,NCE = 2.1 μM, and XNCE = 88 nmol Ca2+/mg/s (176 nmol Na+/mg/s) for a 2Na+/Ca2+ exchange (A,B) andXNCE = 1.41 nmol Ca2+/mg/s (4.23 nmol Na+/mg/s) for a 3Na+/Ca2+ exchange (C,D). Note that for a 3Na+/Ca2+ electrogenic exchange, the Na+ efflux/Ca2+influx with imposed external Ca2+ and Na+ influx/Ca2+ efflux with imposed external Na+ requires the opposite signed IMM ∆ψ. Figure 3: Fitting of Na+/H+ exchanger (NHE) model (lines) to data (points) on NHE fluxes. The initial rates of H+ efflux or Na+ influx were measured (A) with varying external buffer [Na+] and fixed external buffer pH = 7.0 and matrix pH = 6.95 in purified mitochondria from rat heart (the solid circles are the measured H+ efflux rates while the open circles are the calculated H+efflux rates from the measured rates of decreased matrix pH with a fixed matrix buffering capacity of 36 nmol H+/mg/pH unit) (Kapus et al., 1989), and (B) with varying external buffer pH and fixed external buffer [Na+] = 9.6 mM and 15 mM and matrix pH = 7.0 in purified mitochondria from rat liver (Kapus et al., 1988). The model fits to these data sets with KNa,NHE = 22 mM and XNCE = 12 nmol/mg/s (for both Na+ influx and H+ efflux). (C,D) The fitting of the same kinetic model to another data set is shown where the initial rates of decrease in matrix pH or H+ efflux in rat heart mitochondria were measured with varying matrix pH and fixed external buffer pH = 7.0 and [Na+] = 50 mM (Kapus et al., 1989). For the kinetic model to fit this data set, the XNCE value is adjusted to 18 nmol/mg/s while keeping the KNa,NHE value fixed at 22 mM. Figure 5: Independent validation of the integrated model of mitochondrial Ca2+ handling. Comparison of model predictions (lines) to the experimental data (points ± SD) of McCormack et al (McCormack et al., 1989) on steady-state relationships between matrix and external buffer free [Ca2+] in purified respiring rat heart mitochondria in the presence of extramitochondrial Na+ and/or Mg+ or an uncoupler (FCCP). The buffer free [Ca2+] was maintained at a desired level with the addition of calculated amount of EGTA and CaCl2 to the external buffer medium; ● with no further addition, ♦ with 10 mM of NaCl, ■ with 2 mM of MgCl2, ▲ with 10 mM of NaCl and 2 mM of MgCl2, and ○ with 1 μM of FCCP. The integrated model was fitted to the data by fixing the Michaelis-Menten binding constants in the models of CU and NCE as esti-mated before (i.e., KCa,CU = 90 μM, KNa,NCE = 2.4 mM, KCa,NCE = 2.1 μM), but allowing the activ-ity parametersXCU and XNCE to vary. However, the activity of NCE (XNCE) was fixed at the same level for all data curves, while the activity of CU (XCU) was allowed to vary over the data curves (to implicitly account for the inhibition of CU by extramitochondrial free [Mg2+]). The left panel (A,C) is for 2:1 NCE stoichiometry model, while the right panel (B,D) is for 3:1 NCE stoichiometry model. The upper panel (A,B) is with the CU model without accounting for the inhibition of CU by matrix free [Ca2+], while the lower panel (C,D) is with the CU model with accounting for the inhibition of CU by matrix free [Ca2+] to better fit the integrated model to the steady state distribution of Ca2+ across the mitochondrial inner membrane. The activity parame-ter values that were used to fit the model to the data are (A,B) XNCE’ = 4•XNCE and XCU’ = 10•XCU (●,♦),XCU’ = XCU/12.5 (■), and XCU’ = XCU (▲), and (C,D) XNCE’ = 2.5•XNCE and XCU’= 20•XCU•Ki/ (Ki+[Ca2+]x) (●,♦), XCU’ = (XCU/5.5)•Ki/(Ki+[Ca2+]x) (■), and XCU’= (XCU/0.6)•Ki/(Ki+[Ca2+]x) (▲), where XNCE = XNCE = 3.375X10-5nmol/mg/s, XCU = 1.5×10-2 nmol/mg/s, and Ki = 1 μM. Dash RK, Beard DA. Analysis of cardiac mitochondrial Na+ – Ca2+ exchanger kinetics with a biophysical model of mitochondrial Ca2+ handing suggests a 3 :1 stoichiometry. J Physiol 586.13: 3267–3285, 2008.